Jesus answered (Satan), "It is written …"
Gene Wolfe is a fiction, fantasy and science fiction writer. The kind of books he writes are the kind that you either love and can’t wait to continue the story in his next novel, or it’s a style that has no appeal whatsoever. His books are full of symbolism, suspense, hidden motifs, slight-of-hand plots that mislead the reader. There are themes tucked away under the plot that are deep and meaningful - some of which demonstrate his Christian faith. "We met other travellers today, four merchants with their servants and pack animals. We were glad to see them; but they, I believe, were even more glad to see us, because they had quarrelled and were eager to air their grievances. I listened as long as I could bear it and longer, reminding myself of the foolish quarrels in which I myself have been involved, often as the instigator. It is educational, as well as humiliating, to listen to others voicing complaints like our own. They were all thoroughly bad people of the type to which I belong—that is to say, bad people who are pleased to think themselves good." Let me rephrase that last sentence, "These people, like me, are thoroughly bad people who like to think of themselves as being virtuous and good." Wolfe might be a science fiction novelist and through his description of this group of people has struck out at all of us. He hits us right between the eyes with a blow that strikes at the core of our being and leads us to ask ourselves, "Are we thoroughly bad people who are happy to think of ourselves as virtuous and good?" You know, that’s not a bad question to pose as we enter this season of Lent. At the end of Lent is Good Friday and the terrible suffering that Jesus endured on the cross for us. Lent is a time of reflection on how much love that must have taken to endure so much for such undeserving people. Lent is a time of realising the part that each one of us had to play in the torture and death of Jesus. When the character in the novel said, "They were all thoroughly bad people of the type to which I belong—that is to say, bad people who are pleased to think themselves good" I can’t help but include myself here, and my family and my friends and everyone here in the church, in fact, every person in the world. It’s easy to pretend that we are better and wiser than other people. we readily point the finger, even in the church, and blame everyone else for some shortcoming. We are all thoroughly bad people who are happy to think of themselves as good and virtuous. But how can I say such a thing? You might object saying, "I’m not like that at all. I’m not a thief, a liar, a cheat, a fault finder or a violent person". But as you say this I ask, didn’t Jesus tell a story about a couple of blokes praying in the temple. One of them looked sideways at the guy nearby and prayed, "God, I thank you that I am not greedy, dishonest, and unfaithful in marriage like other people. And I am really glad that I am not like that fellow over there. Besides I go to church every Sunday and do the best I can for other people". 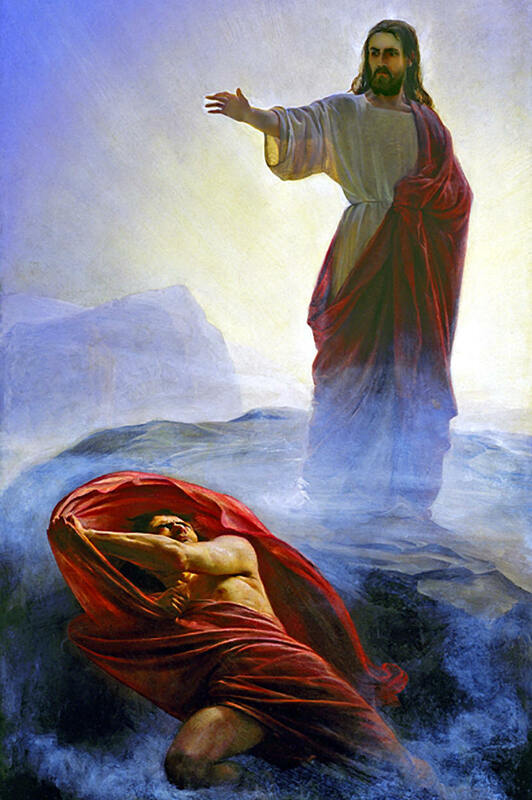 Jesus indicates that there is something terribly wrong about this man’s perception about sin and how it affected his relationship with God and concludes by saying that the fellow he was belittling was closer to God than he was. Herein lies our problem. The first Sunday in Lent has a focus on temptation and when most people think of temptation they think of things like sexual lust, greed, dishonesty, the violence that we see reported on the TV news especially the violence amongst our children and youth. We think of those who easily fall into the temptation of gambling or too much alcohol or are hooked on finding ways to inflict harm on others. These kinds of sins are easily recognised and we shake our heads in disgust at how low people can go. And it is precisely at this point that Satan puts it into our head that we aren’t as bad as those people and that our little "mistakes" hardly count for anything when compared to the big sins that rule the lives of others. Satan has subtly led us into the sin of "self-righteousness". Gene Wolfe’s character in his novel is worth listening to. "They were all thoroughly bad people of the type to which I belong—that is to say, bad people who are pleased to think themselves good." We might think of King David at this point and how he spied on his next door neighbour, the beautiful Bathsheba, while she was taking a bath. David knew the Ten Commandments, especially the one about taking another man’s wife. He knew it was wrong to orchestrate another man’s death so that he could steal his wife. David knew God and worshipped him. Many of the spiritual songs of the Old Testament are attributed to David, and yet, in spite of all this even this great man of God fell hook, line and sinker for Satan’s temptation. David fell into the same sin as Adam and Eve and you and me – namely Satan convinces us that wrong is right. He is so good at twisting things around. Didn’t Satan ask Eve, "Did God really say that you can’t eat from this tree? Nothing will happen to you. You certainly won’t die, in fact, you will become like God". We too are easily convinced that it won’t matter, no one will know about this "little" indiscretion, and besides everyone else is doing it so what’s so wrong. Satan loves to twist things around. Just look at the ways he tempted Jesus. He’s very good at quoting the Scriptures trying to convince Jesus that it won’t matter if he turns stones into food, or jumps off the temple roof or bows down before Satan. God won’t mind, in fact, this is a quick road to being recognised as the Saviour without all the pain and suffering and dying. What Satan was offering was all very logical and good common sense but at the same time he was making wrong appear to be right. A mighty God-fearing man like King David was tempted. Jesus was tempted. You and I are tempted whether the sin is ‘big’ or ‘little’ it makes no difference. It is sin – going against God's ways and the path we have been called to follow as the people of God. In fact, sin can be defined in an even wider sense. It isn’t just our actions and words that are sinful; they are just symptoms of a much bigger problem. Sin is at the heart and core of who we are. It is at the centre of our fallen nature that we were born with. It is part of our inheritance that we have received from Adam and Eve through our parents and their parents and so on. Even if it were possible for us to refrain from words and actions and thoughts that were sinful, sin is still at part of our very make-up. From the moment we are conceived we are members of sinful humanity. As much as we might like to think that we are good people, we are "bad people who are pleased to think ourselves good" to use Gene Wolfe’s words. God's condemnation of sin is clear. He is holy who made us to be holy (that is, to be without sin). He has called us to be his people at our baptism and yet we fail to live up to that calling. He has given us the Holy Spirit to guide us in the choices we make; yet we choose to ignore the Spirit’s guiding. Rather than choosing God's way we choose what is the easiest, the most appealing to our sinful natures and most acceptable to the world around us. We will be tempted; there is little doubt about that. What matters is how we handle temptation. First, note how Jesus counteracted Satan’s temptations - with Scripture. He knew his Bible. He had learnt it as a child. He memorised it. When he preached God's Word we are told he spoke as someone who had authority. When it came to temptation he knew what was the right thing to do because he knew what God’s way was. And the only way we can know God's way is through reading, studying and learning God's way in the Bible and letting the Holy Spirit use those words to guide us in the choices we make. We do ourselves a great disservice by ignoring the treasure God has given us in the pages of the Scriptures. We can avoid so much pain and uncertainty by listening to the voice of the Holy Spirit guiding us through the Scriptures. Even then, there will be those occasions when we forget whose we are and give in to sin. And this is where reading today from Romans 10 is important. "If you confess that Jesus is Lord and believe that God raised him from death, you will be saved. For it is by our faith that we are put right with God; it is by our confession that we are saved" (Rom 10:9-10). There is only one antidote to the poison of sin and that is the grace of Jesus Christ and faith that claims the forgiveness he offers as our own. In the face of some of the most devastating and depressing sins and even those that we trivialise, Jesus’ death and resurrection has made it possible for the wall that sin creates between God and us to be torn down. In Christ we are reconciled to God; we are made friends again and the way to a happy life with God now and forever is opened to us. The season of Lent is a time when we reflect on and repent of the ways we have so easily followed Satan’s temptations and our sinful desires. We readily acknowledge that we try to dismiss our unkind, unco-operative, uncaring, unfriendly, critical, selfish words and actions as if they don’t matter and what is more try to justify them. We want to be different – to be more christlike in our dealings with others. The season of Lent is also a time to thank God that sin doesn’t have the last say. Jesus has won the victory.